In a time crunch? No worries! Book our signature Glo & Go 30 min facial and your skin will be looking refreshed in no time. Got a little extra time on your hands? Be sure to purchase one of our add-on services, such as an antioxidant enzyme peel, microdermabrasion, or high frequency treatment, to get that truly luminous complexion. Enjoy a relaxing customized organic facial geared towards your skins every need. Whether you want a clearer complexion, or a youthful, radiant glow, this facial addresses your main concerns with a skin evaluation, steam, deep extraction, peel, and face mask, along with a light body massage. Using all organic and natural products, this facial will leave your skin feeling nourished and revitalized. 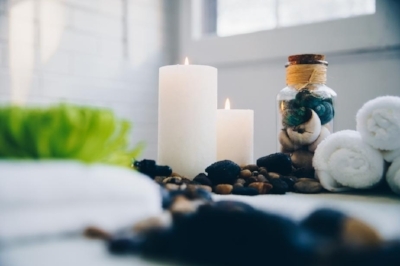 Leave your problems at the door and enjoy a relaxing massage at The Wild Plum! We offer Deep Tissue, Hot Stone, Swedish, and Prenatal massages ranging from 30-90 min. You will leave feeling brand new, ready to conquer the world! And did we mention we have a Detox Sauna? Allow the steam and heat to melt all your worries away before your relaxing massage! The Wild Plum is also a full service Waxing Salon, specializing in browRefresh and browRevival services at our Brow.Rx Beauty Bar. And don't worry gentlemen, we offer Manscaping as well! What is the brow.rx beauty bar? designed to make your brows pop, giving them a fuller, more natural shape.